Yum! Medication sprinkles anyone? 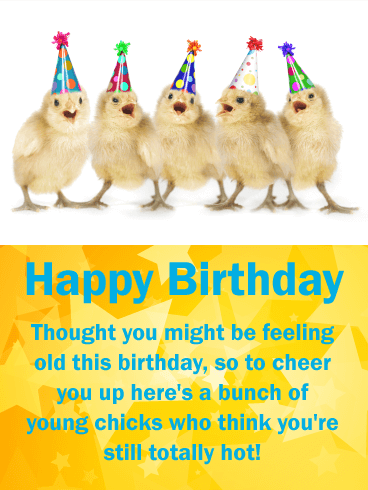 This clever birthday card is sure to draw a few chuckles. We might be getting older, but we're not too old to laugh! 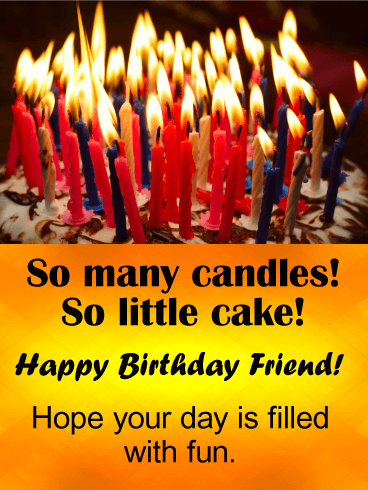 Wish your good friend a happy birthday and send a humorous card today. 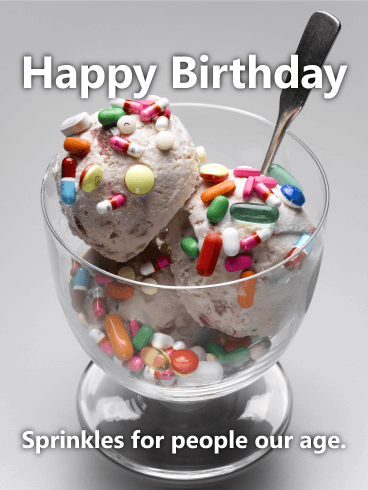 Ice cream all around please, but don't forget the sprinkles! 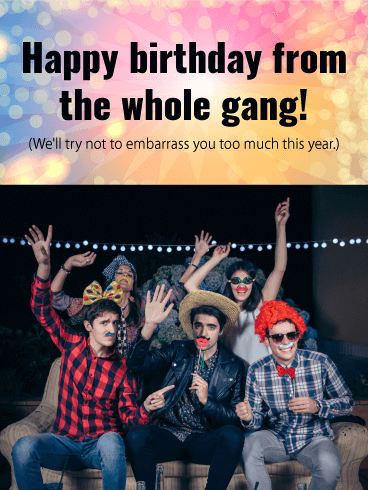 This birthday card will be unforgettable for any friend who can still laugh about getting over the hill. Maybe your friend is old enough to have a fossil record named after them, or maybe your friend has just barely made it out of the primordial soup. 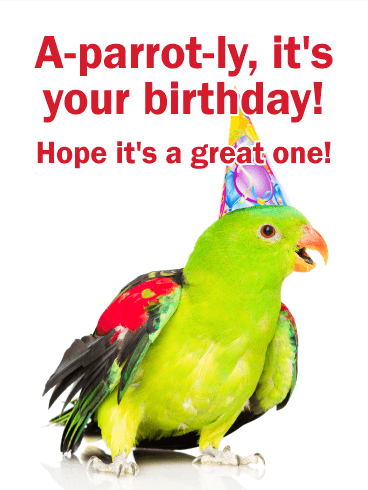 No matter how old you are, everyone loves a good birthday pun! This T-Rex birthday card is an excellent one to send to your friend on his or her birthday. Who doesn't love those tiny arms? Dinosaurs rule. 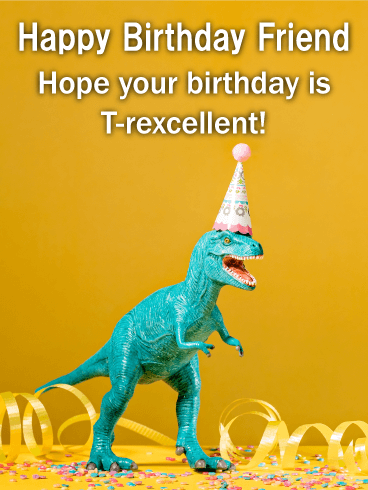 Send a T-Rex birthday card to your bestie today. What are birthdays for if not to carbo load? 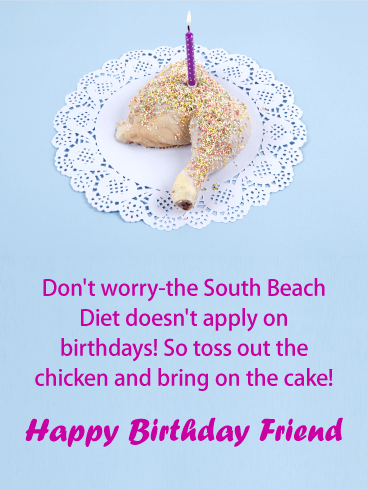 Your friend can get back to their protein diet after their party! 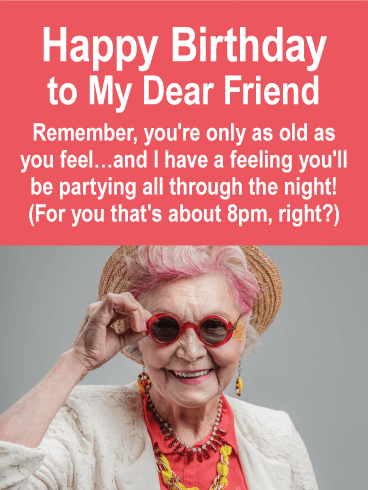 This humorous birthday card lets your friend off the hook. It is definitely okay to say yes to cake today. And also to ice cream. And definitely sprinkles! 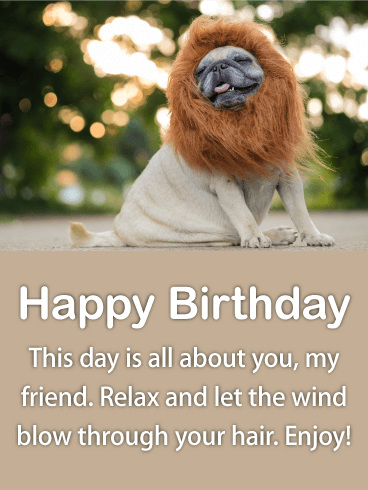 Wish your friend a great day with this funny birthday card. To My Special Friend? Yikes, talk about creepy. 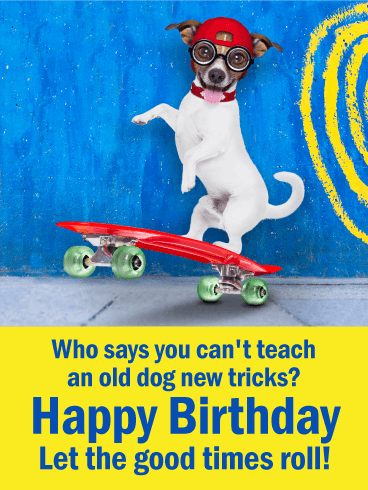 Talk about the perfect birthday card for the friend who's always playing practical jokes on you! Clowns stopped being the epitome of birthday fun years ago, now they're just harbingers of the weird. 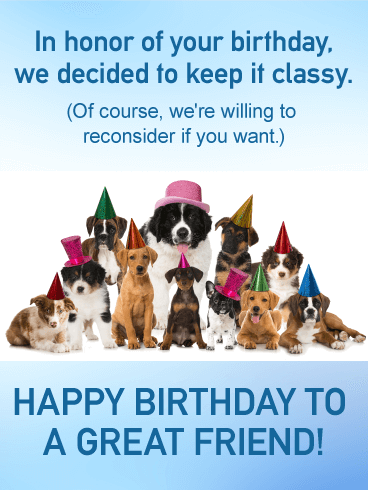 And yet somehow, they make for really good, really humorous birthday cards. Huh. Go figure. 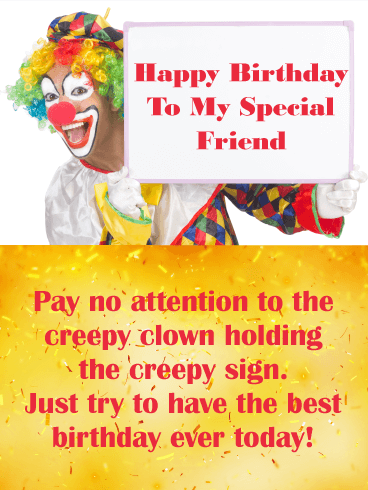 Send to your good friend who has a healthy fear of clowns today! Never. Stop. Partying! 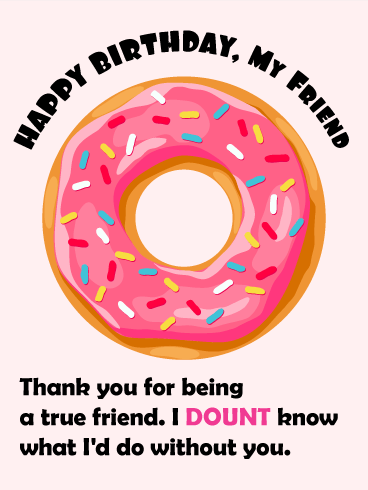 Send a silly birthday card to a good friend today. 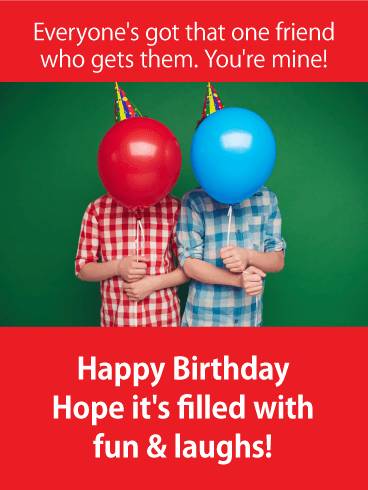 Celebrate their day with this festive birthday card wishing them a day where the fun just won't stop. It's all good times up in here. 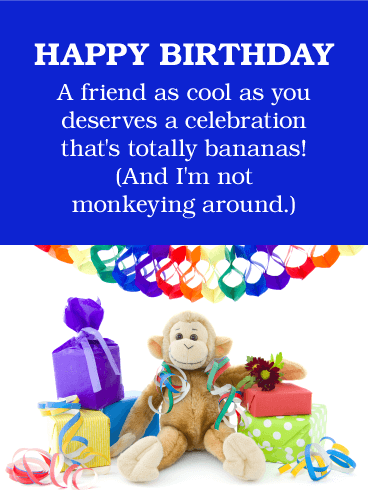 Friends are fun and sending birthday cards to friends is even funner. We swear funner is a word. OK. It's not. But still. 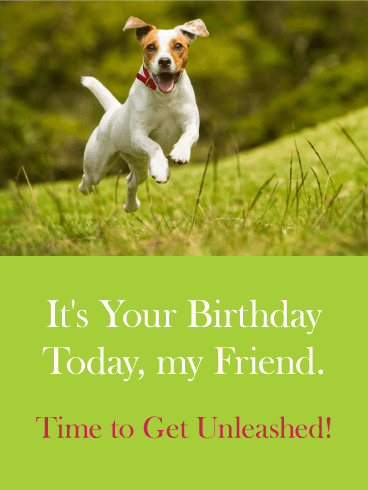 You're gonna love celebrating birthdays with our one-of-a-kind birthday greeting cards! 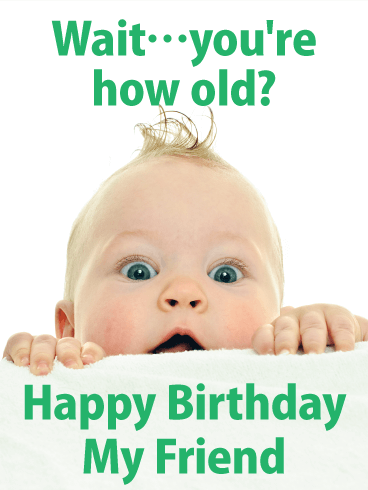 Nothing like a cute baby to remind us how we've aged. Remember when tummy rolls were cute, and no one talked about thigh gaps? Yeah, those were the days. 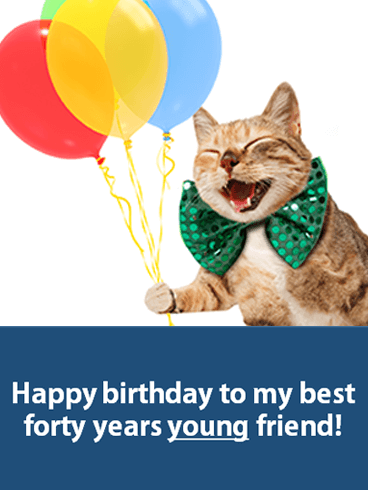 Celebrate the years with this funny birthday card. 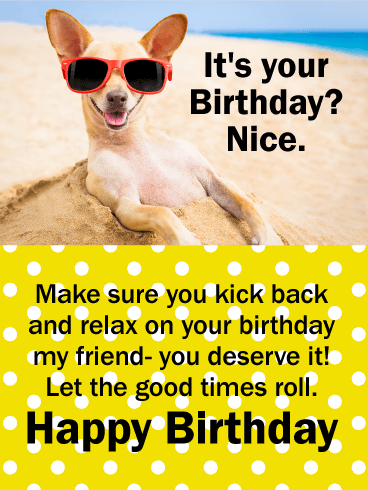 Send a quick birthday wish to a good friend to help them celebrate their day right. 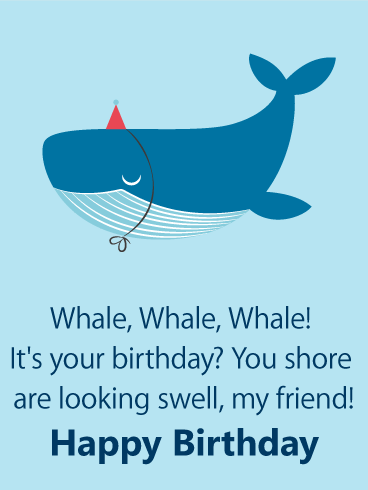 Our humorous birthday cards are real rib ticklers. 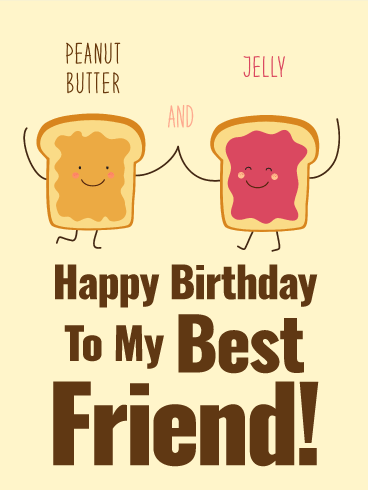 This is the perfect birthday card to send to a friend when you both are in the "29-and-holding" category! 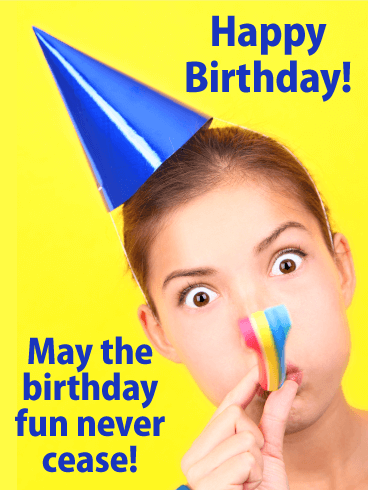 The cute little girl in the birthday hat may represent your friend's true feelings about being one year older, but you want to remind her that she's fabulous no matter what her age! 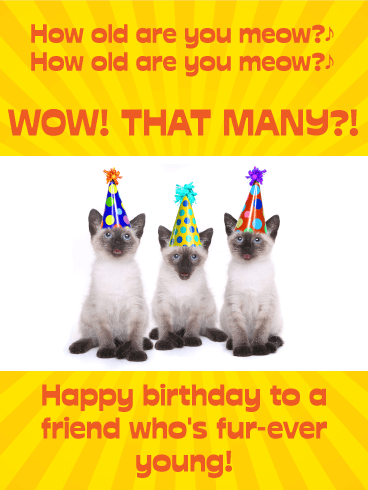 Celebrate your friend's special day with this funny birthday card. 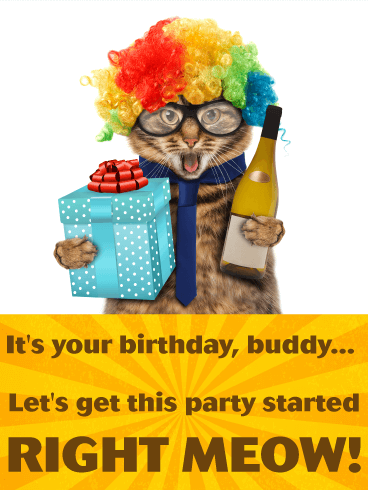 This funny birthday card features a cat who's ready to party. He's arrived on the scene wearing a rainbow wig, with a gift in hand and a bottle of wine to start things off right! 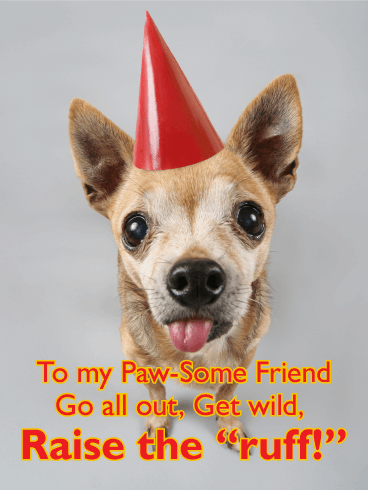 This funky, charming birthday card is perfect for your wild-and-crazy friends who are also an animal-lover. 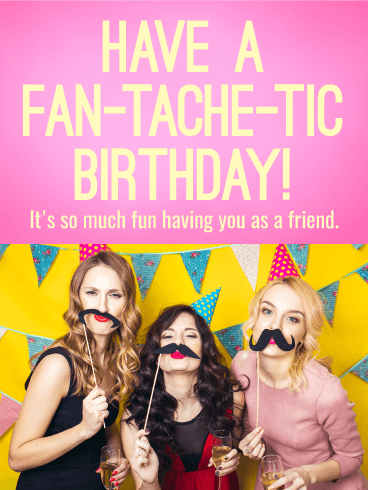 They will be totally tickled and will LOL at this funny birthday card. This adorable bulldog looks like he may have partied a bit too much! 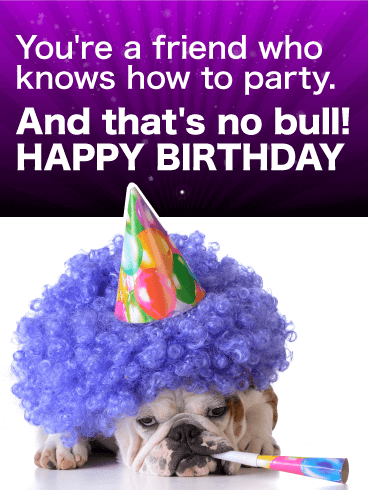 With his crazy purple wig, birthday hat and noise maker, he must have been quite the 'party animal'. 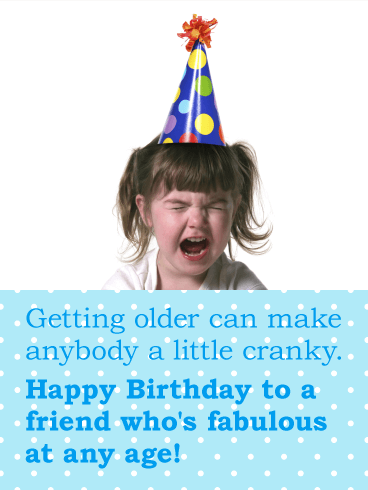 This funny birthday card with its clever message will bring a smile to your friend's face. 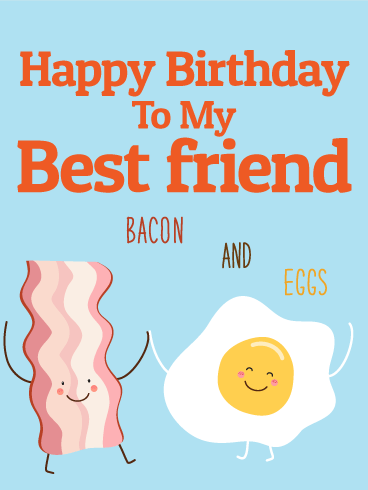 Show your sense of humor by choosing this funny birthday card to celebrate your friend's special day. 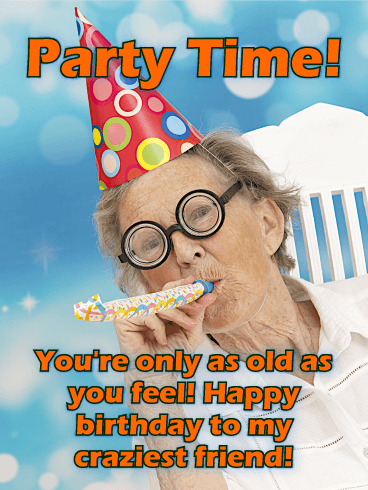 Looking for a funny birthday card to send your friend who is getting up in years but is still young at heart? 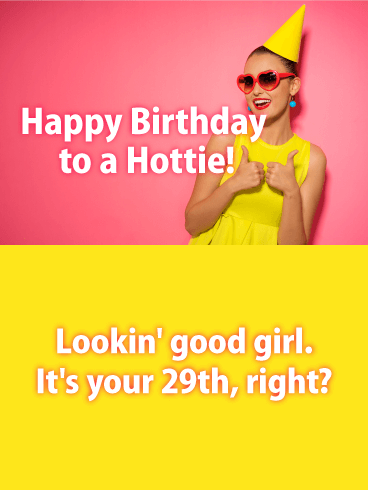 This witty birthday card is the perfect choice. 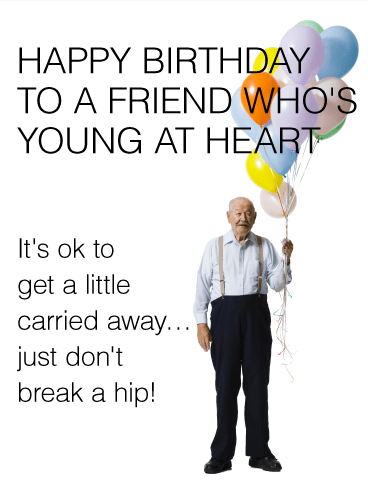 An elderly gentleman about to get "carried away" by his large bunch of balloons is the image on the funny card. 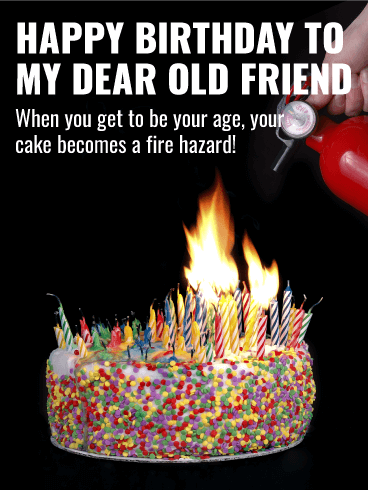 The light-hearted message on this funny birthday card will tickle the fancy of your older friend in a kindly way. 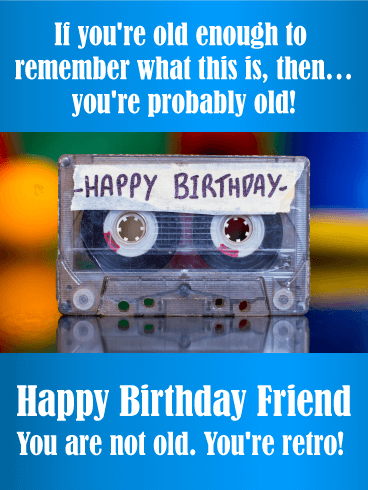 You can't go wrong with this amusing birthday card.